1 Jesus went to the Mount of Olives. 2 Early in the morning he came again to the temple; all the people came to him, and he sat down and taught them. 3 The scribes and the Pharisees brought a woman who had been caught in adultery, and placing her in the midst 4 they said to him, “Teacher, this woman has been caught in the act of adultery. 5 Now in the law Moses commanded us to stone such. What do you say about her?” 6 This they said to test him, that they might have some charge to bring against him. Jesus bent down and wrote with his finger on the ground. 7 And as they continued to ask him, he stood up and said to them, “Let him who is without sin among you be the first to throw a stone at her.” 8 And once more he bent down and wrote with his finger on the ground. Some experts on Sacred Scripture maintain that this Gospel passage does not belong to John’s Gospel but is more appropriate in Luke’s Gospel. The style and the content of the passage are the reasons for this. Some time ago I was checking the passage in a non–Catholic Bible and to my surprise the passage was not included. The Catholic Church, the Orthodox and the major Protestant groups regard the passage as canonical (belonging to the canon of sacred scripture) and divinely inspired. We have no hesitation in using it in the liturgy. 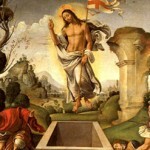 “Jesus went to the Mount of Olives” — It would appear that Jesus went to the Mt. of Olives at night for two reasons, safety from the Jewish authorities and for prayer (Jn. 18: 1). “Early in the morning he came again to the temple” — In John’s Gospel when the glory of God is about to be revealed, the passage opens with the words “at daybreak” or “early in the morning”. Jesus is “the Light” that is about to bring light into the world. “all the people came to him, and he sat down and taught them” — “All the people” emphasises the size of the crowd and the heightened embarrassment of the woman being displayed before such a large number of people. “The scribes and the Pharisees brought a woman who had been caught in adultery, and placing her in the midst” — The last words before this verse were “he sat down and taught them”. This is a teaching passage. We are not told what Jesus taught but immediately we have this story of the woman caught in adultery. The subject matter, as presented by the scribes and Pharisees, becomes the observance of the Law. Jesus adds the importance of mercy in observing the Law. The scribes and Pharisees try to embarrass the woman by placing her in the middle of a large crowd. Her greater distress would have been knowing that she was under threat of death. “a woman” — This woman was married as in the Jewish Law adultery was only between a married woman and a man. A liaison between a married man and a single woman was not adultery. “they said to him, ‘Teacher, this woman has been caught in the act of adultery” — The scribes and Pharisees refer to Jesus as “Teacher”. They referred to the woman as “this woman”, said in a disparaging manner. They were so self–righteous; they condemned the woman out of hand. They did not accuse the male adulterer who was also to be condemned and punished by the Law (Dt. 22: 22–24; Lv. 20: 10). He was not brought. “Now in the law Moses commanded us to stone such. What do you say about her?’” — The scribes and Pharisees put a question to Jesus hoping to trap him, perhaps expecting him to show mercy and forgive her which would be contrary to Deuteronomy 22: 23 and following. It is also possible that if he allowed the stoning he would have been opposing the Romans who forbade Jews inflicting the death penalty for any reason. “This they said to test him, that they might have some charge to bring against him” — They showed no interest in the sin of the woman nor in her punishment by death other than being an opportunity to entrap Jesus and condemn him before the Jewish and Roman authorities. He would have been punishable by death for promoting that. “Jesus bent down and wrote with his finger on the ground” — Whether Jesus was actually writing words or doodling is not clear. If the latter he would have indicated his disinterest in answering them. “And as they continued to ask him, he stood up and said to them, ‘Let him who is without sin among you be the first to throw a stone at her.’ And once more he bent down and wrote with his finger on the ground” — The scribes and Pharisees did not intent to allow Jesus ignore their questions. He spoke, ignoring the question but putting a practical point, namely, if any of them had never sinned he could condemn the woman by throwing the first stone. What he said was according to the law of Deuteronomy 17: 7 — “The hands of the witnesses shall be the first raised against the person to execute the death penalty, and afterward the hands of all the people.” In other words, he faced them with a trap — if they threw the first stone they would need to prove that they were sinless, otherwise they would be breaking the Law. He then continued to doodle. “But when they heard it, they went away, one by one, beginning with the eldest” — It was the word of Jesus that made the scribes and Pharisees depart, not what he wrote. The indication is strengthened by the following words; even the people, who had come to listen to Jesus teach, had left. “and Jesus was left alone with the woman standing before him.” — Only Jesus could remain because he was the only one “without sin”. “Jesus looked up and said to her, ‘Woman, where are they?” — Jesus addressed her as “Woman”, a sign of great respect and he did not belittle the woman in any way because of her sin. He used this title when speaking to his own mother. “Has no one condemned you?’ She said, ‘No one, Lord.’” — Jesus treats her as a human being and refers to her as “you”. She replies by addressing Jesus as “Lord”. The scribes and Pharisees never addressed her at all and addressed him as “teacher”. “And Jesus said, ‘Neither do I condemn you; go, and do not sin again’” — Jesus does not condemn the woman. Nor does he condone her sin. She is free to go but is not to sin again. He offers her new life. Jesus saves; the self–righteous condemn. 1. 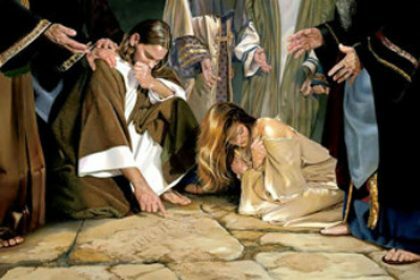 Jesus’ Love towards his Accusers: This Gospel passage is generally referred to as “The Woman Caught in the Act of Adultery”. It is that, of course. However, that is but the example given to bring out the contrast between the power of hatred and the power of love. Hatred can destroy peoples’ lives; love can elevate and transform them. People justify their hatred and the destruction and havoc it can bring because of some suffering or hardship imposed by others. They claim it as a right. On the other hand there are those who by their love refine the lives of others and give them new life and a new outlook on life because of the experience of love. The power of love is infinite; it is divine. The power of hatred is diabolical. The scribes and Pharisees did not hate the woman nor were they really concerned with the Law. Their love for the Law had become warped because of their hatred for Jesus. They saw their opportunity to trap Jesus by using the woman’s breaking of the Law as their excuse. Jesus realised their intention. He did not rail or rant against them. He reminded them of the Law which said that those among them who had no sin could be the first to stone the woman. He did not embarrass them by looking them straight in the eyes but he bent down and allowed them to slink away. He showed them mercy by quoting for them the word of the Law and by not looking at them to allow them sneak away without his notice.. They had quoted the Law to express their hatred; they had exposed the woman to public view. Jesus’ mercy was not just towards those who loved him by even towards those who hated him. What made his mercy towards these men so exceptional was that Jesus knew the whole purpose in their bringing the woman was not just her death but his own when they would accuse him before the Romans who did not allow the death penalty exercised by Jewish. 2. Contrast: Two Types of Sinners: While the sin of the woman is obvious, the sin of the men who apprehended her is quietly overlooked, as if their sin had noting to do with the Gospel passage. And what is their sin? As the devils once answered Jesus, their sin is ‘legion’. Their deepest sin was their pride and self–righteousness. This brought about their hatred of Jesus. This brought about their seeking to kill him. To do so they found a woman in the act of adultery, that must have been with her husband’s connivance, and they exposed her in the Temple before a large number of people. They were not allowed stone her, the Romans had forbidden that. But they were prepared to kill in order to have Jesus put to death. Jesus quietly confronted them and helped them see that they were indeed sinners also. They moved away quietly. Jesus showed compassion to the woman. He did not condemn her. He forgave her. He did not dwell on her sin nor reprimand her for her fault. He showed her that he respected God’s Law and he invited her to do likewise. He showed her true love. Her life was radically changed by Jesus who showed that his interest and concern was for her as a person rather than in only her sin.